Ian Marshall Fisher's Lost Musicals is now in its 21st year having resurrrected over 70 neglected Broadway shows. The.2011 London Season has been announced and includes three semi-staged productions at the Lilian Baylis Studio at Sadler's Wells. Music by Arthur Schwartz, lyrics and book by Howard Dietz book by George S. Kaufman. Not seen since 1931 this was considered at the time to be the finest revue in Broadway history for Fred and Adele Astaire with songs including Dancing in the Dark, I Love Louisa and High and Low. Music by Andre Previn, book by Alan Jay Lerner. Written in 1969 for Katharine Hepburn (later played by Danielle Darrieux and Ginger Rogers) about Chanel’s fight as a woman in her 60s trying to maintain her reign as a leading fashion designer while younger designers start to usurp her place. Music and lyrics by Cole Porter, book by Herbert and Dorothy Fields. . Written in 1944 starring Bobby Clark and June Havoc (the original Baby June whose early life was portrayed in the musical Gypsy). 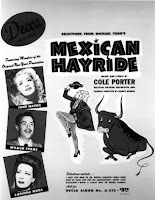 About American Joe Balscom a fifth rate "Guys & Dolls" type racketeer who unwittingly becomes a Mexican hero. Casting for the 2011 Lost Musicals season is still to be announced.